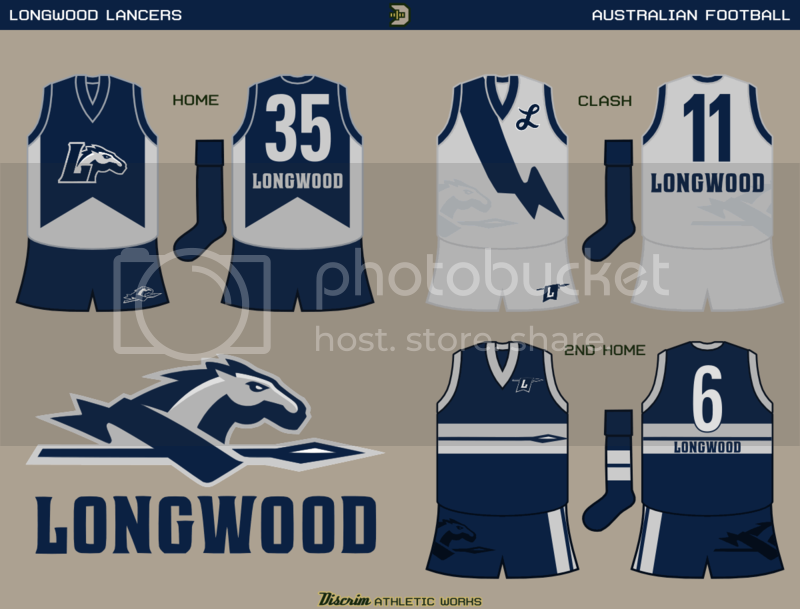 Decided the main design would utilize a two-tone racing stripe, with the anachronistic addition of a pocket. Hey, you never know when you need noseplugs after a failed mark, am I right? 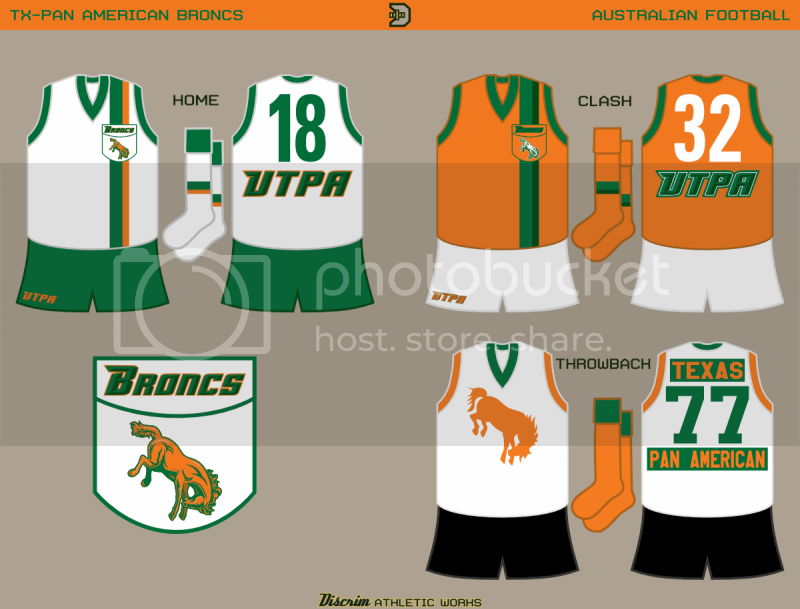 In any event, then, the fauxback is more 60s-70sish fare, the previous bronc silhouette on front, and the school name sandwiching the number on the back....with contrasting nameplates, no less. 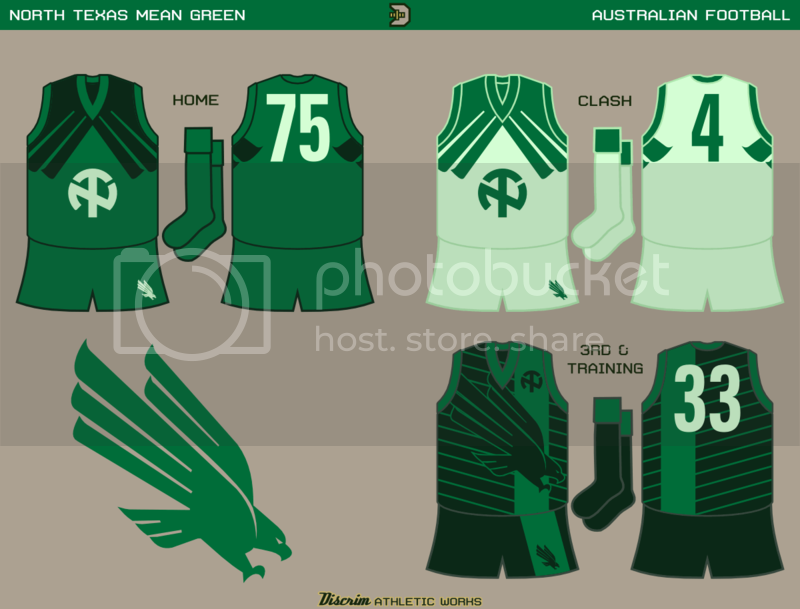 I'm actually a fan of the pocket on the guernsey. And that 2-tone green stripe is pure money. Admittedly, combining halves and hoops is one of the stranger ideas I've gone with (not something I'm retroactively embarrassed about 15 minutes after I post it, but eh). The off center logo on the clash, ditto. There's no rhyme or reason other than I thought it looked good that way. The third...I'm considering a new Geelong concept, and visited footyjumpers.com for the first time in a few months to review their pre-VFL stuff. The skinny Ajax stripe, for lack of a better term, is basically taken from a very old Geelong jumper (and recolored, naturally). 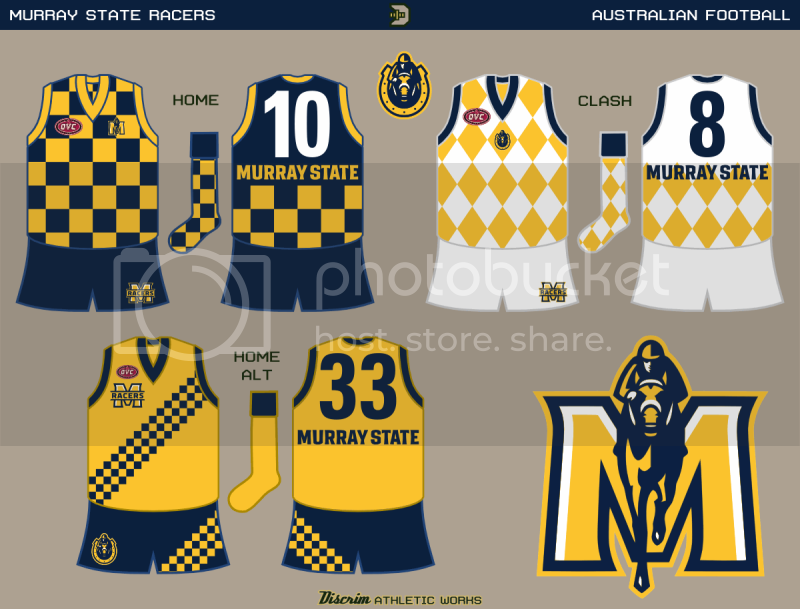 Then...I'll just say Murray State's awesome revamp was jumper worthy and be done with it. Ironically, the two alternate M's that inspired both the home and clash design? I wound up not using them. The first choice is blue/gold checkers, with a blue back, complete with checkered socks, while the clash features gold and white diamonds with a white back (and likewise, matching diamond socks). Going off topic a bit, there's this one soccer blogger who the Columbus Crew should've given a look, as his Crew identity overhaul is IMO far superior to what they actually went with (he kept the hardhat rather than the shield, for starters, but I digress). He was also that guy with the World Cup themed tees for all 32 countries...and I bring him up because I'd remembered his Croatia shirt, which has the same checker-sash I used on the third guernsey...and all I did was recreate it in blue. As Lil Rob would put it, why lie? Last couple times I happened to see UTEP's football team on TV, seems there's enough nostalgia for the goofy looking running miner they used to use that someone deemed it a good idea to put him on the helmet. Evidently the badass grandpa I used here is getting Penn Stated. Whatever, here goes UTEP. 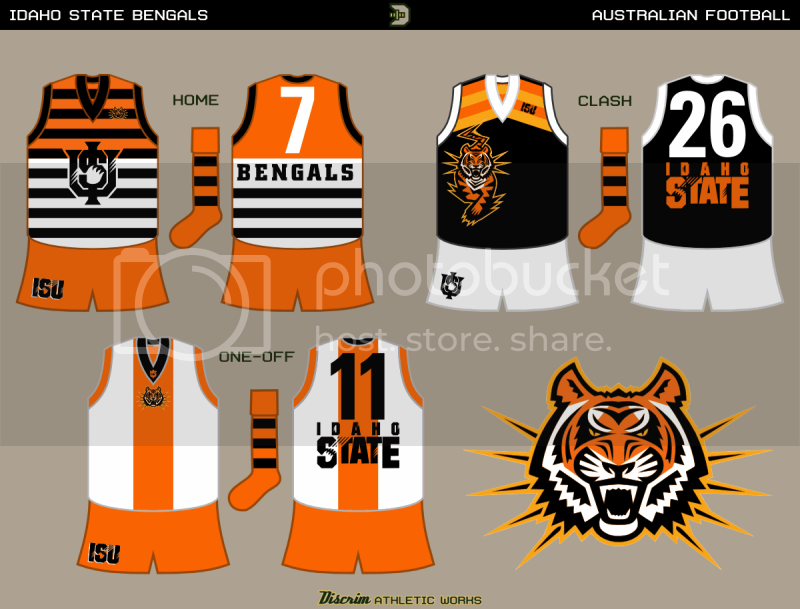 The home jumper's design is a shameless ripoff of the Gold Coast Suns' only good jumper, seeing as it intends to evoke the sun (and El Paso is home of the Sun Bowl). The clash white, I basically aimed to add to the scenery the miner's traversing. 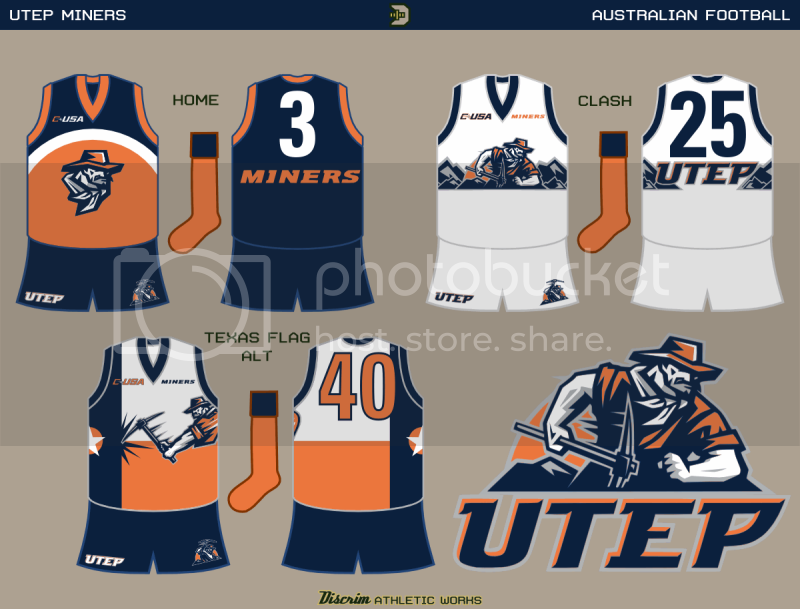 A UTEP-flavored take on the Lone Star flag serves as the third, with an orange circle representing the sun making a cameo behind the star. 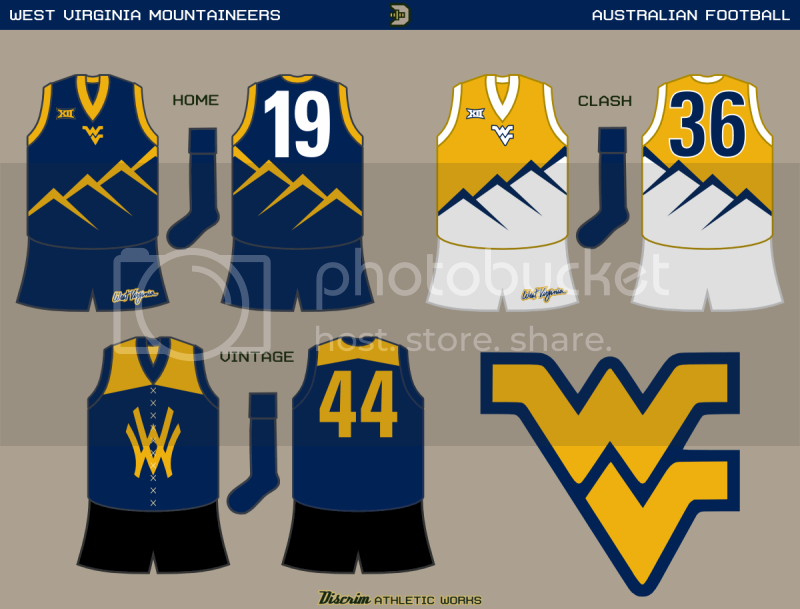 Finally, I'll be honest, West Virginia's logo always makes me think of Wonder Woman. Not to the extent of the old Wichita Wings, but still. Likewise, I'm kinda like the WAFA's Oakland A's...I rarely have any high volume goalkickers, so I had to go all Billy Beane and get guys who get a lot of marks and disposals. I've long known that designers should probably not advertise that they have favorites of their own work, but I have concepts I love and those few I'd disown if it weren't obvious it was my work. It's safe to say Murray State's among the former. Among the latter, though...several years ago, I was oddly insistent on using the ugliest templates this forum has ever seen, and believe it or not, I was unaware that the program I was using was a vector program. Anyway, a fellow WAFA member convinced me to collaborate with him in a Philadelphia City Six (Temple, St. Joseph's, Villanova, Penn, LaSalle and Drexel) footy series, and honestly, we both posted some great stuff. Except for my Temple clash...to this day, I wonder why the hell I thought releasing something that looked like kid's pajamas was a good idea. I tend to get hyperfocused when I'm working on a concept, so sadly, I didn't realize what a travesty I'd created until about 15 minutes after I'd posted, but since it'd been seen, all I could do was own up to it, bash myself and move on. The original's tire stripe is expanded upon, so now it's a whitewall tire, and I include the whitewalls on the shorts as well. 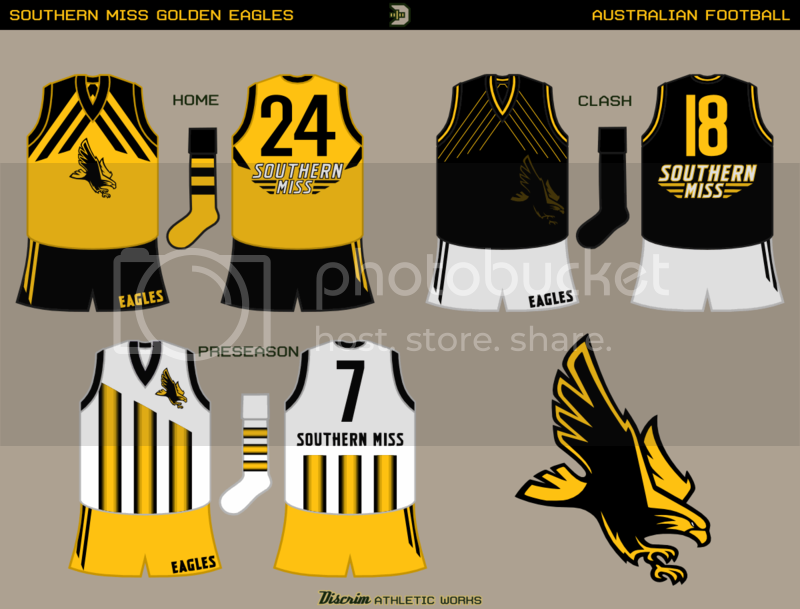 The clash remains gold, but the road stripe is replaced by the whitewall tire, and the fauxback's collar was modified so it looked more like it could actually be a zipper-front guernsey. I figured it'd be a good idea to maintain the racing stripe I used in the UTPA concept, though the first choice's color is now orange. 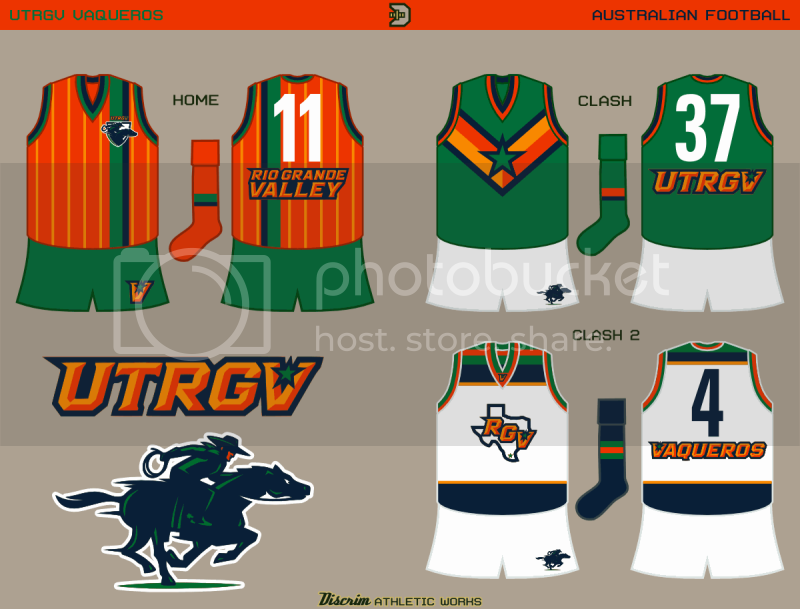 A green jumper with a two tone orange V based on the secondary V-star serves as the clash, and then there's a hockey-ish white third with predominantly blue striping. The Cats traditionally wear navy and white hoops, though when they began playing way back when, they wore solid navy shirts. They soon decided to switch to red, however, because everybody and their mama was wearing blue, though they'd eventually figure out a way to return to using some blue. As they say...you should know me by now Because it's so unlike everything else they've ever worn, I figured it was a good time to pay it tribute, as the clash. The first choice's hoops are thinner than normal, and the preseason is pretty much a thin Ajax stripe with shadow hoops, based on another past Geelong jumper. Nowadays Freo just wears purple and white. 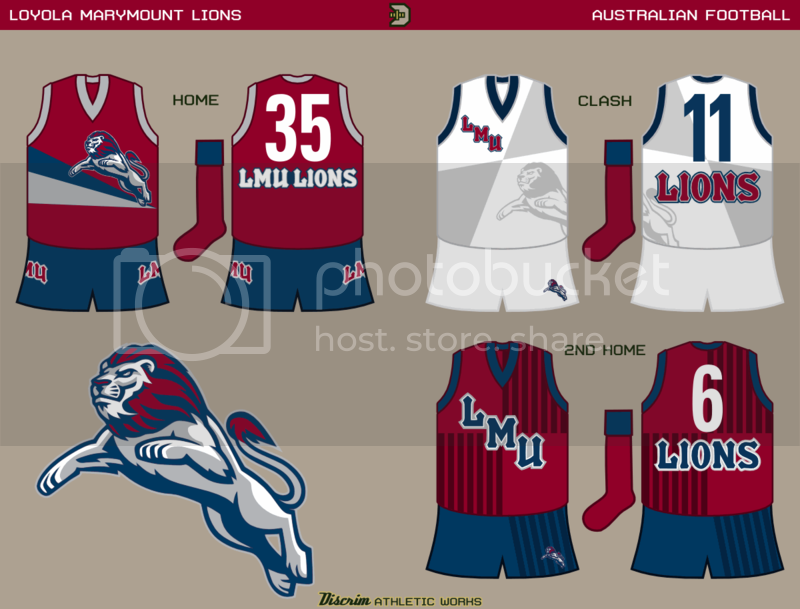 Originally, though, they included red and green, to expand on their nautical theme (port and starboard, naturally). This is my nod to the old anchor jumpers. Can I just tell you how awesome these are? 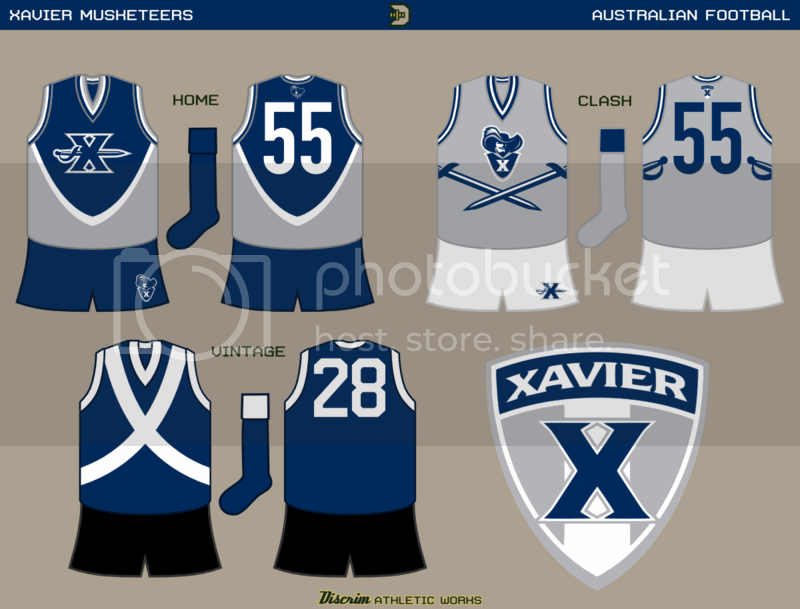 The templates are phenomenal, and I love how each guernsey is different. These are all great! Love the zipper on the Akron vintage. Basically, I decided to use as many shades of green as I could. Their normal kelly green, a dark jungle green and in place of white, mint green. The NT monogram, based on a similar logo used in Mean Joe Greene's day, is something I felt better suited what i was going for than almost anything they currently have, with the exception of the Son of Worm. I've honestly become disillusioned with ginormous logos in recent years, but I figured it'd work well on the third design. 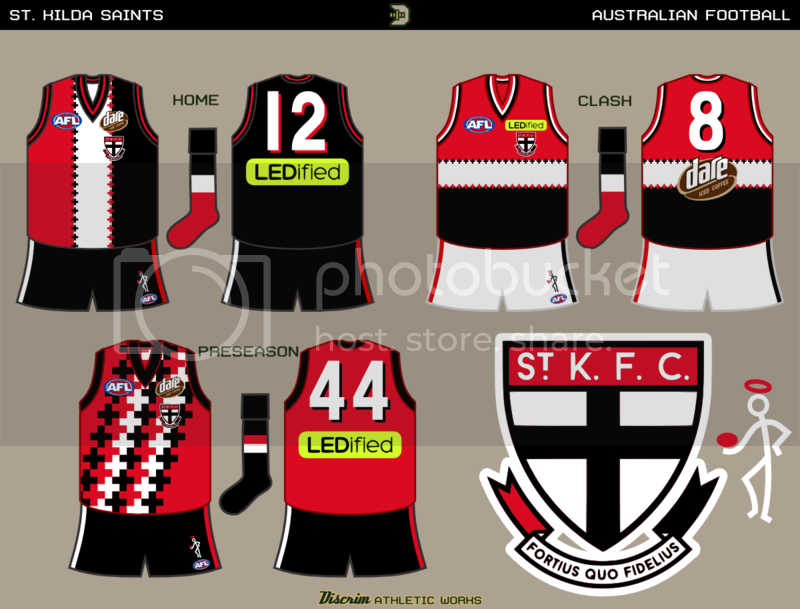 I'd used AusGiant's modified Saints crest, as I thought it looked better than the real one, and for the main jumper, it's the traditional tricolor with the addition of small crosses dotting the borders. The clash is basically a horizontal version of the tricolor, and the preseason jumper was inspired by an Inter Milan training shirt I saw once. IT'S ALIVE! THE FOOTY THREAD IS ALIVE! Anyway, that Mean Green concept is really all green, and I really like that you did that by adding a green tint to the numbers. As for St. Kilda, the home and the clash just seem too similar to me. 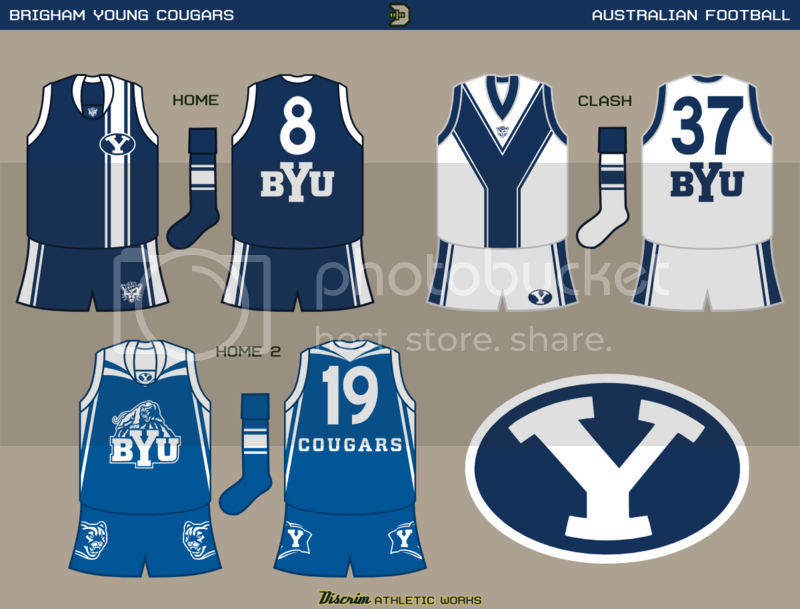 Maybe you could go with white, with the top and bottom parts being sublimated, but keeping the colored crosses intact. 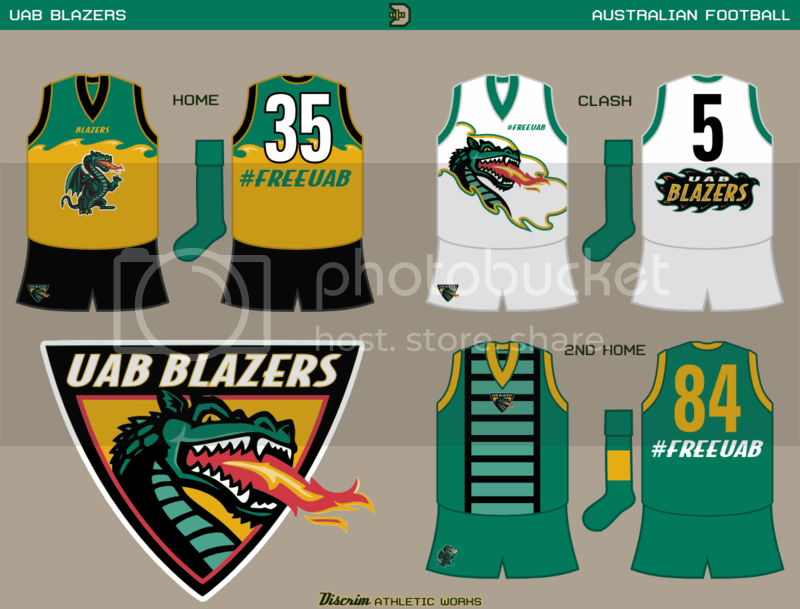 These concepts just amaze me and your uniqueness with going with footy is really commendable. Great Job! The home and clash both use a flame motif, to varied extents, while the 2nd home is modeled after a dragon underbelly. For the home, I figured a two-tone tapering stripe would fit well with the leaping lion. For the clash, a slanted take on quarters. Finally, for the clash, shadow-striped quarters. You might be wondering why the third jumper's red when the home and clash are straight black and white. 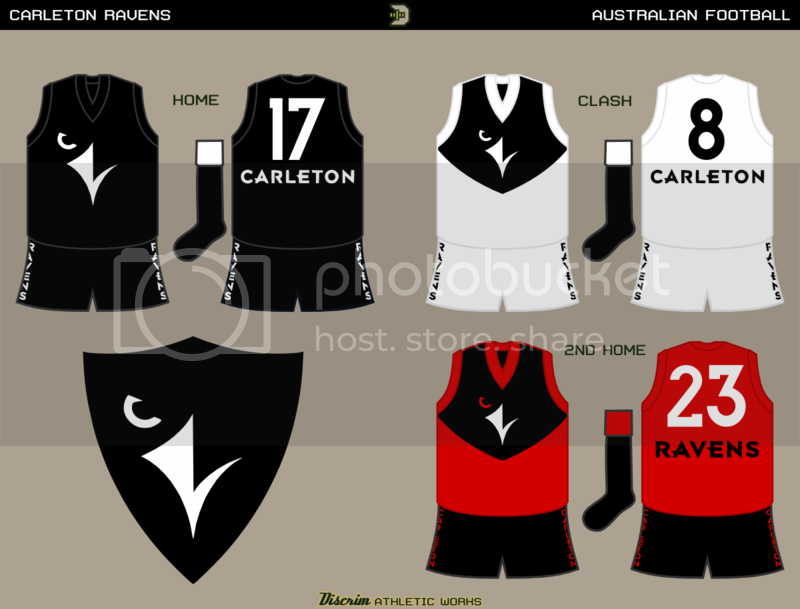 Carleton teams have been known to occasionally use red as a trim color. Carleton looks fantastic. Great set. Back to footy, in time for the AFL finals...and holy crap Freo's the minor premier. Mind blown. The third: basically, Scrim. Faux gradient. Together again. The spears on the home jumper are meant to resemble Australian football goalposts (kick it between the tall ones, get 6 points. Kick it between one tall and one short, settle for one point. Between a short post and thin air? Gain only shame and ridicule. Basically footy in a nutshell.). 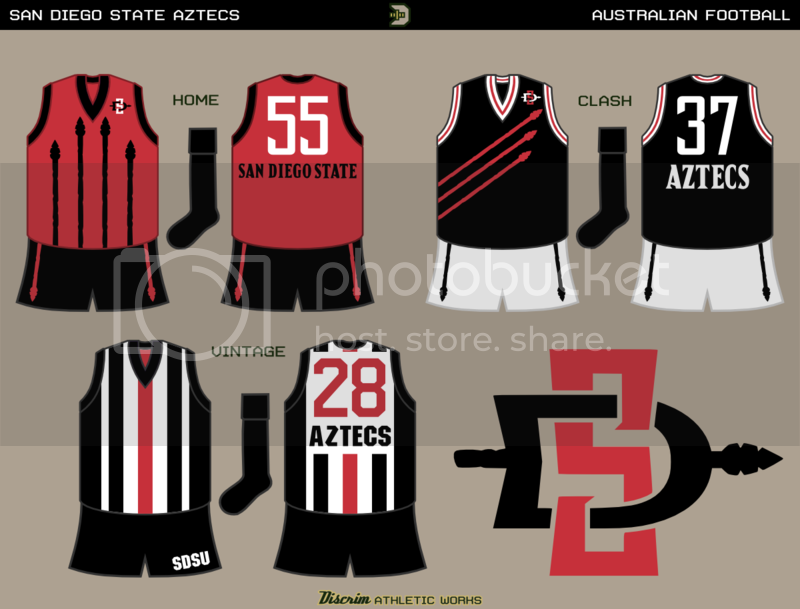 Spears make a sort of sash on the black jumper, and then the throwback is based on the Marshall Faulk era SDSU football uniform, its striping specifically. 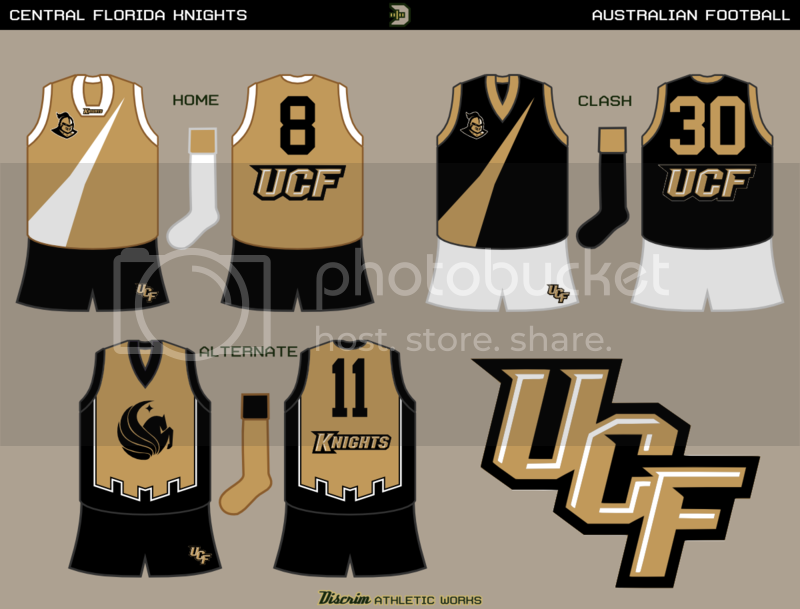 The home gold and clash black both use a lance-inspired sash (diagonal's more like it, but I'm a tad rusty)...the alternate, if I were Nike, I'd dub "Knight of Pegasus" given the use of UCF's academic logo, a pegasus (which also adorned the football helmets a few decades back). 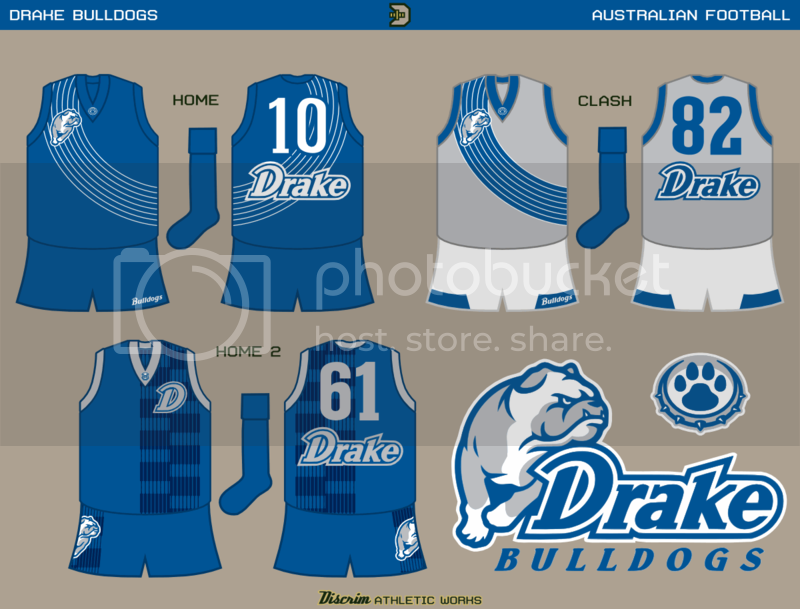 The Drake relays inspired the running track sash. Not sure what inspired the 3rd jumper's design. I just found this thread and read it all. You did a phenomenal job! Are faux zippers and faux buttons and such commonplace in footy? I'm not really familiar with it. 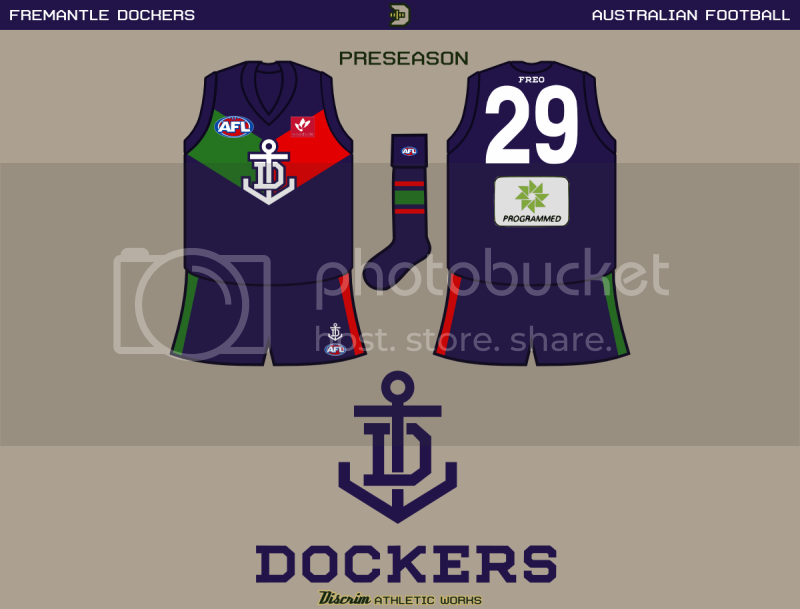 BryantH: sorry for the monthlong wait, but to answer your questions: many of the earliest Aussie rules guernseys used laces, though since all the AFL clubs wear sublimated jumpers nowadays, throwbacks from the 1800s and early 1900s often utilize sublimated laces. 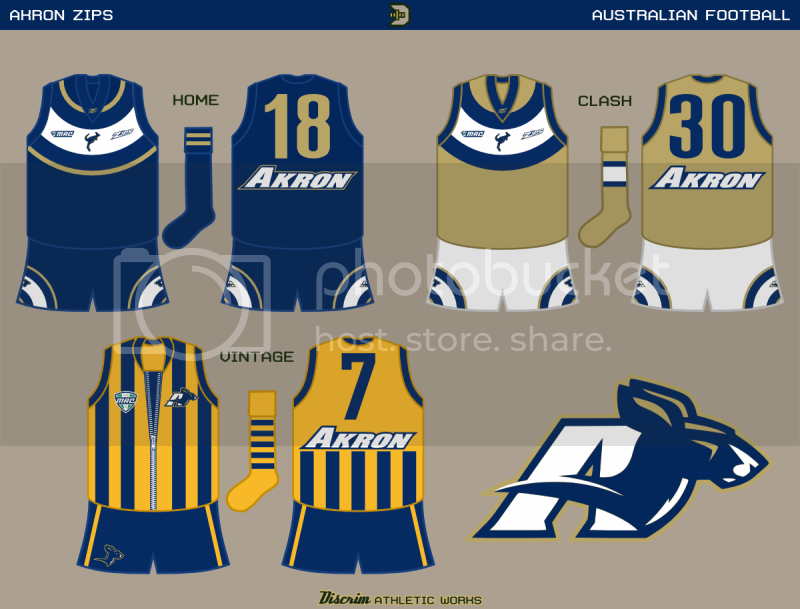 The faux zipper, in this case, was inspired by both the laces and baseball's forgotten zipper era, which was overshadowed by the pullover era, and at least in my mind, is exclusive to Akron (take a wild guess what "Zips" was originally short for), though had college Aussie rules existed here in the 40s or 50s, I imagine there might've been schools who decided to adopt zippers either after seeing Akron in action, or independently. Buttons, not so much, given the tackling and all. The home "darkest royal blue" (yes, they actually call it that. At least, they called it that last time I checked.) kinda looks like a bowling shirt, after some hindsight. The clash design is a big Y, and the alt is an experimental design. 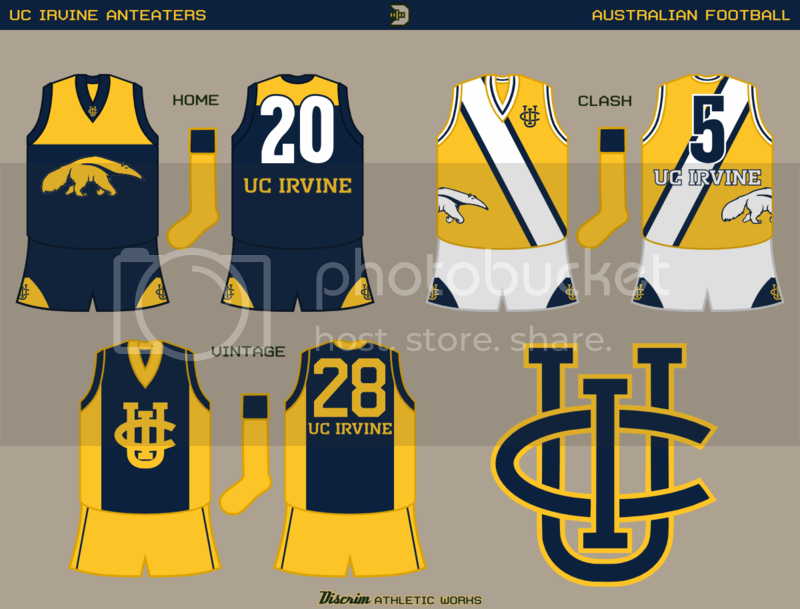 The home is based on Brisbane's, with the anteater taking the lion's place...the clash is a fairly standard sash, and the fauxback combines the UCI monogram with an Ajax stripe. 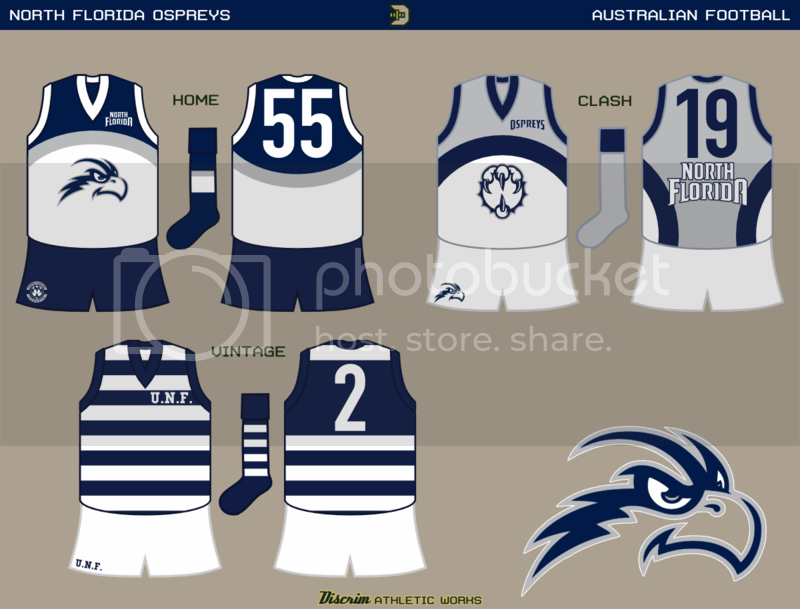 An old North Melbourne away jumper inspired the home design, as did the fact that UNF's osprey logo is a relatively odd one. 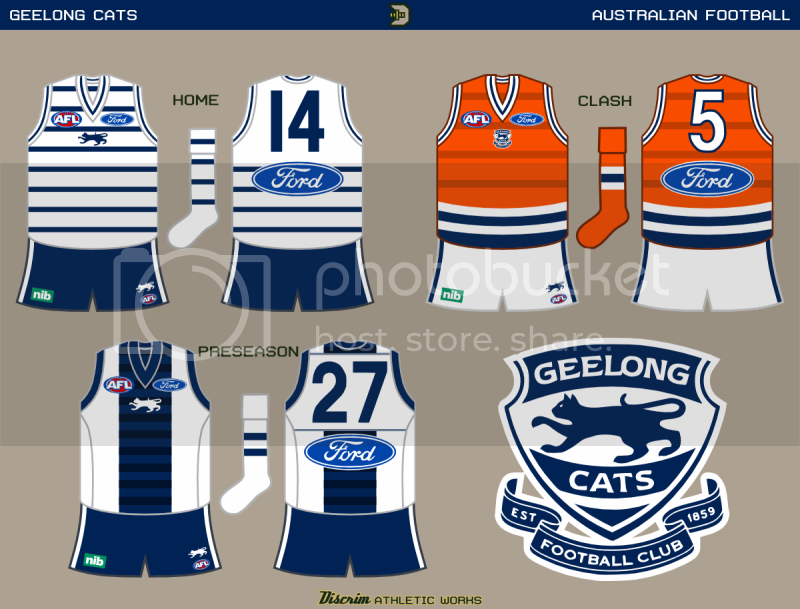 Then there's the similar but different clash, and the fauxbacks, intended to resemble Geelong hand-me downs customized slightly. 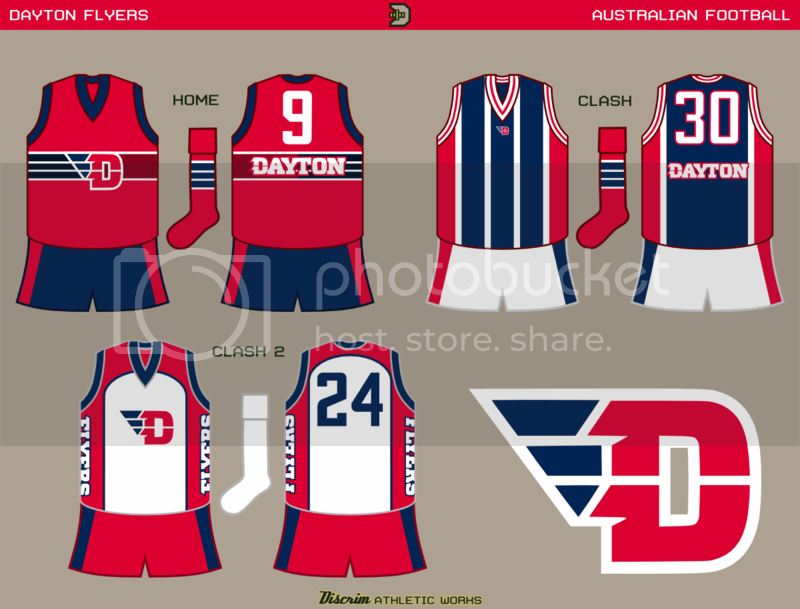 I had the Penguins' late 90s jerseys on my mind when I made the home red. The other two are firmly in the realm of "trying :censored:"